I noticed a big difference right away after crossing in to Costa Rica. People here dress a bit more in fashion, drive more late model SUVs and luxury cars. It somehow feels clean and organized. No lifestock on the streets, not many people walk or ride bicycles. Unless, it's for recreation. I saw several Big Bikes, Harleys, BMWs and Ducatis. A world apart from their neighbors to the North. I saw joggers and a bicycle racing event. Definitely more Gringos. Definitely more money here. At least that's my observation while riding in the coastal region. It may be different in other parts of the country. Food seems to be more available and better tasting as well. 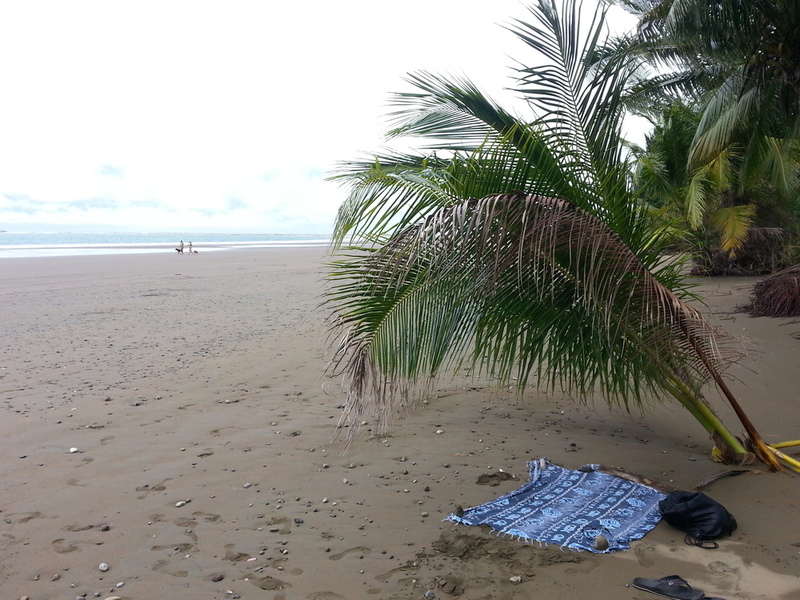 I had fish tacos at a beachside bar in Jaco and breakfast the next morning in Uvita, both good. But, I have to admit, I 'm more a street food kind of guy. I remember, while on a motorcycle trip through Thailand recently, I would pull up to one of the many food vendors roadside, park and eat a bowl of noodle soup or pad thai sitting right on my bike. Or next to my bike on a plastic chair watching cars and people go by. Fast, simple, cheap. I like that kind of stuff. Unfortunately, that market seems to be a bit underserved here. From the bikers point of view, speedbumps NONE, potholes NADA, No obsticles that have a heart beat (saw a horse getting struck by a semi-truck. Not a pretty sight). There seems to be a large off-road community here. Noticed lots of motocross bikes on the back of pick-up trucks. Did not go off-road myself. Stuck to the paved roads (for now), which are a breeze to ride on. I am assuming, with all the rain, going in to the mud would pose a real challenge for my heavy BMW. I'll leave that one for later. The landscape is lush and scenic with lots of waterfalls and curvy roads. Pacific ocean to the West, rain forrest to the East. It feels, the color GREEN must've been invented in Costa Rica. September/October is low/rainy season, which leaves the roads somewhat less crowded, making riding conditions in this part of Costa Rica nearly ideal.